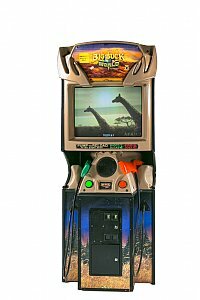 The Big Buck Hunter is one of the top shooting arcade game rentals that we offer for trade shows as well as corporate and private events. This version is the Big Buck Hunter World. Big Buck Hunter World combines two previous versions, Big Buck Hunter Safari and Open Season into 1 arcade cabinet. This shooting arcade game rental has been labeled a global hunting experience since event guests can choose from 255 hunting sites across 4 continents. There are a variety of animals and critters that event guests can take aim at while participating in this shooting arcade game rental. There are 18 trophy animals, 77 crazy critters as well as 17 animals from around the world. 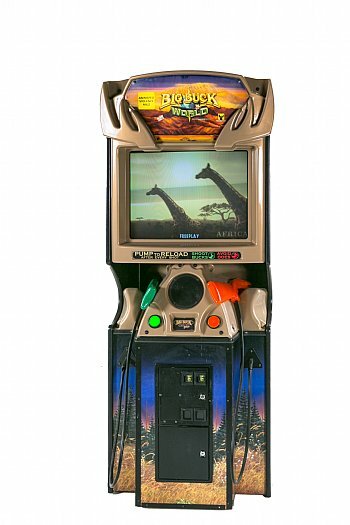 Big Buck Hunter Arcade Game can be set on free play or set to accept tokens if the rental is for a trade show or other type of event activation. The arcade game has 2 shotguns so event guests can either compete against each other, play individually or play in a team mode where they hunt together. There are two different levels of difficulty which can be programmed in advance of a trade show or corporate event; normal and easy. In the normal mode when the trigger is pulled, the shotgun has been to be pumped to be reloaded. In the easy mode, when the trigger is pulled the shotgun reloads itself without pumping. This is a very important distinction that can effect individual scores if you are setting up Big Buck Hunter for a competitive type of rental. There are other programming features that can be done prior the rental. One such example is that the high scores can be cleared prior to a trade show or other event activiation. This would allow for new high scores to be recorded during the event if for instance a prize is being given out. Please speak to one of our event specialists at 800-969-1196 to learn what can be programmed for your rental. The branding options available for this shooting arcade game rental are the exterior sides and the marquee.